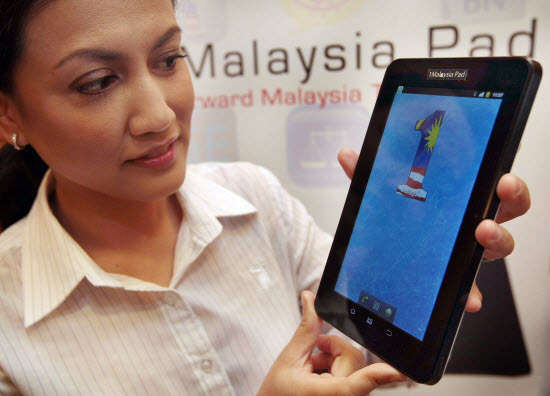 Last week MalTechPro Sdn Bhd unveiled the first Malaysian made 7-inch tablet known as 1Malaysia Pad, or 1Mpad which is fully equipped with a capacitive touch screen, android system, wireless broadband, 3G and the latest applications. In my previous posting, I wrote an article regarding India's world cheapest tablet, the Aakash and Malaysia seem to have followed suit in launching an Android tablet. But unlike the US$45 to $70 Indian version, the 1Malaysia Pad is priced further up at RM999 (US$315). The Borneo Post reported that the tablet is equipped with a proprietary 1Malaysia messenger app which would allow users to send messages, pictures and videos for free. While this appears to be more powerful than the low-coast Aakash, at its current high list price, the tablet doesn't appear to be a fantastic deal. RM999 is relatively expensive for a 7" tablet, more so with better specced and affordable offerings in the market are available, such as the Galaxy Tab 7 Plus at RM1,200 (US$380) and still dropping in price. Samsung Galaxy Tab 2 7.0 was last seen priced cheaper at RM799 (US$250) but I'm unsure if this model is still available in Malaysia. Befitting its name, this tablet is targetted to be first marketed to students at a discounted price. Domestic Trade, Cooperatives and Consumerism Minister Datuk Seri Ismail Sabri Yaakob said the ministry planned to include MalTechPro as a merchant in the ministry’s student discount card program, due to kick off next month. The amount of the discount has not been decided yet but this is touted to be a replacement for the current 1Malaysia netbooks in universities. Would you buy one of these for yourself? I think it is too expensive and the manufacturer will have to persuade the government to push it to the people through various 'donation' programs. An introductory price of RM699 - RM799 would have been more appealing considering such technology has been around for sometime, plus, the OS is an outdated one. Throw in the option for WiFi and Wifi + 3G to reduce the price further. Newly announced (June 2012) 7-inch Google Nexus 7 is only US$199 (for 8GB) and US$249 (for 16GB version). That'd be RM600 to RM800 and specced higher than the 1Mpad. not even as good as my china-made nexus pro but twice the price.. lol!